Originally from Georgia, the former republic of Russia, she arrived with a degree in physics, and transitioned into the fashion and jewelry career stream, starting as a buyer for Macy’s jewelry department, then a buyer for a major gemstone company. For all the courageous women everywhere who leave their homeland to pursue dreams, here’s to Bella, who exemplifies the spirit of women everywhere doing their best to blend career and family. 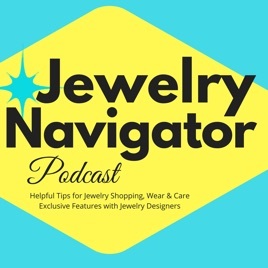 Be sure to hear last week’s episode, a compilation of many of the women and designers I’ve featured on the podcast over the past year in this week’s podcast, “Celebrating International Women’s Day With Women From Jewelry Navigator Podcast Stories“ available on iTunes, Spotify, Podbean, and Google Play Music.